There are many pork recipes: goulash, chops, cutlets, casseroles, and so on. But special chic is to cook a whole piece of juicy pork meat in the oven. Thus preparing not just pork, but other dishes, which many believe is obligatory on new year's night when the table should burst with dishes. Flavorful meat, retaining the juices and seasoned with fragrant spices worthy of a Royal meal. A piece of pork wash under running water, let the water drain out. Clean the garlic, cut it in slices. Prunes cut into medium pieces (if the fruit is small, you can leave whole). RUB the meat with salt and pepper. Thin with a sharp knife make deep slits and put them alternately with slices of garlic and slices of plum. Protiven grease with vegetable oil, lay a piece of foil. Stuffed pork put in the center and wrap the edges of the foil fix to avoid the loss of juice during cooking. Preheat the oven to 220 degrees, put the baking tray for an hour. When the dish is ready, remove the pan and leave the meat in foil to get at least half an hour. Meat wash, dry, cut thin with a knife, RUB with salt and pepper. Peel the onions and cut into half rings. In a saucepan pour a little vegetable oil and fry the meat on all sides. Put the same onion and place in a pre heated oven for half an hour. Meanwhile, wash the apples, dry towel and cut into large slices, remove the core and seeds. Take a saucepan, put the Apple slices, cover with cider. Put in the oven for another half hour. Glances, every half hour: if the cider has evaporated, you can add water. Water formed meat juice. Meat wash, dry. Garlic crush, mix with salt and pepper. RUB the meat with the mixture, cut lengthwise, so that you can put vegetable stuffing. Vegetables peel, cut into (peppers and onions - half rings, tomatoes - sliced, carrots - thin semi-circles). In a heated pan pour a little vegetable oil, fry mix, vegetables, sunflower, you can add chopped or dried herbs. The meat, coat the inside of the cut the mustard put the vegetable stuffing, the ends of the meat connect, tie the thread. Protiven grease with vegetable oil, put the meat, cover with foil and bake in the oven at medium temperature for 1.5 hours, periodically removing the foil and pouring the meat juice. 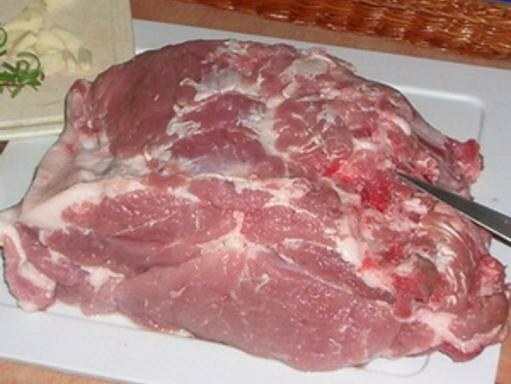 Do not forget to remove the threads from the finished meat. Prunes are better to take sour-sweet varieties. It is better to take the neck or shoulder is the meat juicier.